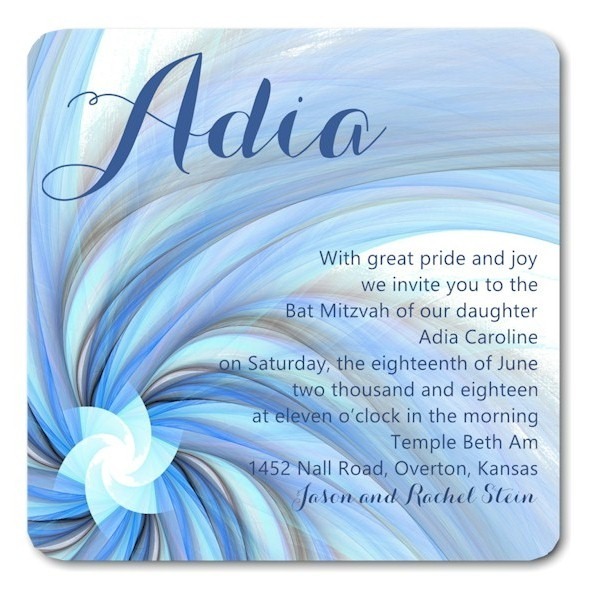 This stunning Bat Mitzvah invitation is digitally printed on 130# card stock and features a contemporary star in the lower left with various shades of watercolors radiating out from the center in a spiral pattern. This stunning Bat Mitzvah invitation is digitally printed on 130# card stock and features a contemporary star in the lower left with various shades of watercolors radiating out from the center in a spiral pattern. The name of the Bat Mitzvah appears in the upper left in jumbo letters for extra emphasis and rounded corners provide the finishing touch. Measures 5-1/4″ square. Shown with navy blue ink. The Reception and Response enclosures will print on matching single card stock and the Thank You notes will print on folder stock. This Bat Mitzvah invitation is accompanied by single bright white envelopes. Please note: Due to the square shape of this ensemble, additional postage is necessary. Please consult your local post office for details prior to mailing.